We have been running from 2004 and have catered for Schools, Teams, Business Groups, Parties,Conflict Resolution Groups, Cross Border Groups, Local People and People on Holidays. It has been a wonderful experience for me and I hope you will enjoy it to. Inishowen has some of the most consistent waves in Ireland due to its exposure to South West, West and Northernly/North-easterly Swells. Its long stretches of golden, sandy beaches make for safe conditions for learning to surf. The Inishowen area has many great surfing spots with breathtaking scenery. 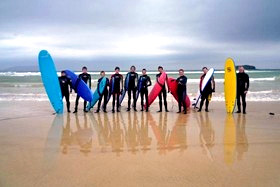 Please visit http://www.inishowensurfschool.com for more information.